The Marketing Platform begins with Bloom surveying those who matter most to your community: your residents and their families. Bloom also interviews the owner and any other key stakeholders in the community. The purpose of this is to gather data on current perceptions of the community and to analyze marketing performance thus far. 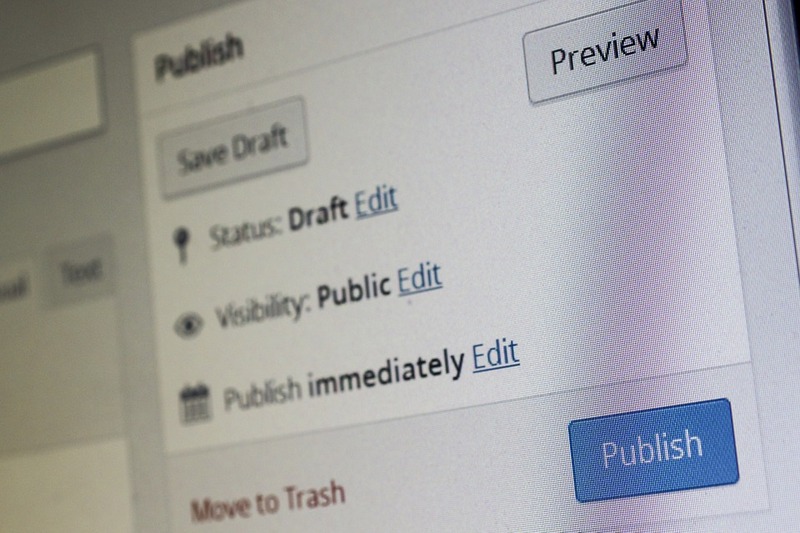 Using that data, Bloom creates the senior living community’s Marketing Platform. The marketing tactics included in the Marketing Platform offering are then delivered with Total Marketing. The positioning statement, which clearly states what your senior living community does at what value to whom. This is written not in professional terms, not with the owner’s words, not even in our words – but in the words of the residents and their families who know and love you most. It is written using the language and attitude of those surveyed. When using this statement on future marketing materials, people in the community will take notice and remember the community. The differentiators are the pillars that support the positioning statement. The differentiators are created straight from the data collected in the survey, written from verbatim responses given by residents and their families for authenticity. With a bit of finesse, the differentiators become the text for the senior living community’s marketing materials, whether that’s a website or direct mail campaign or social media post. Bloom can help in handling all of this. Sample of a client’s Brand Messaging. The brand messaging outlines how your senior living community’s marketing materials will speak, and the mood board is how it will look and feel. Bloom will create a mood board that matches your senior living community’s brand essence and positioning statement, which are based on research and survey results. This way, we are able to keep all of your marketing materials consistent. Together, the brand messaging and mood board serve as the foundation for the execution of your senior living community’s marketing plan, with everything stemming from these two documents. This is not something that your residents or the community will ever see, and it is intended for use by Bloom and your marketing team only. 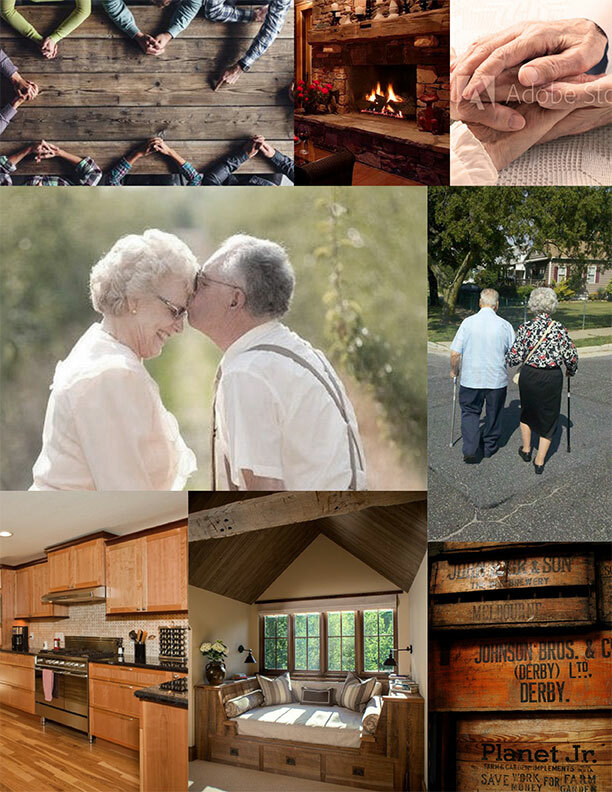 The mood board can be thought of as a mix of images that best represent your senior living community. It’s not based on what you think about your community, but rather what your residents and their families think of it. When we promote your community with marketing materials showing the most authentic version of your community, you emerge as remarkable and unforgettable in the marketplace. As you can see with the mood board below, the brand essence of “Happiness comes to life” really shines through. This particular mood board used only images of the actual facility and their happy residents. Sometimes, mood boards will include more abstract images, but this particular client preferred to see how actual residents portrayed their brand story. Sample of a client’s Mood Board. 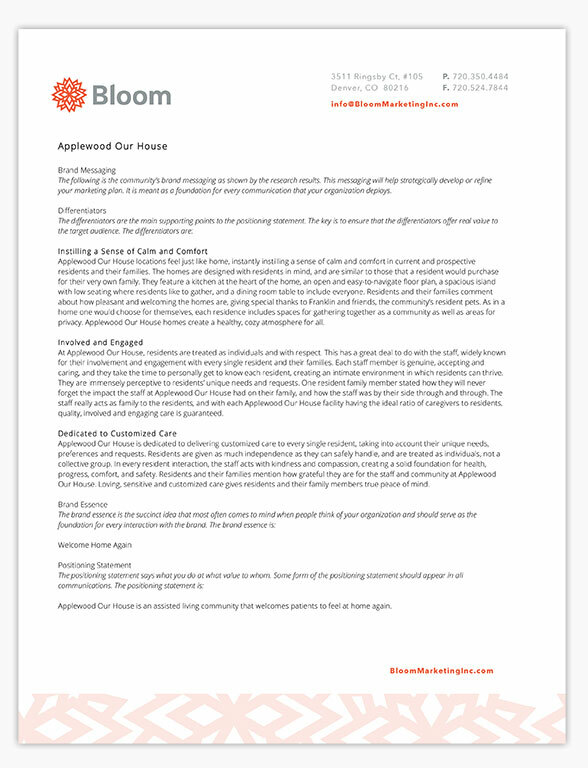 The strategic marketing plan that Bloom creates for your senior living community will act as the roadmap for which marketing strategies should be deployed to achieve optimum results. There are over 50 different marketing tactics that a senior living community could deploy, yet only a handful of those is right for the community at any given time. 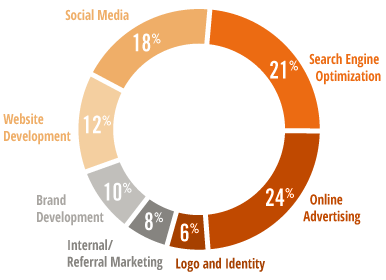 Bloom identifies precisely what marketing strategies are right for the community, right now, as shown by the survey results. 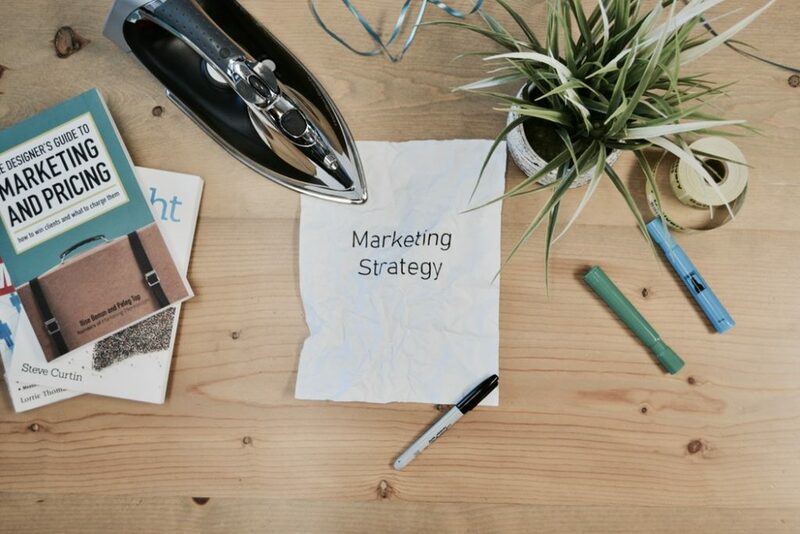 Once the Marketing Platform has been established, you have the option of moving directly into Total Marketing, where Bloom will deliver all of the marketing strategies detailed in your Strategic Marketing Plan. If you decide to move forward with Total Marketing, your investment into the Marketing Platform will, of course, be applied to the fees associated with that portion of the Total Marketing. Upon completion of the Marketing Platform, if we decide we are not a good fit to continue working together, we part ways. Simple as that. Either way, Bloom will create a marketing plan for your senior living community that has a lasting shelf life of about 1-5 years and has the power to help get you to your quantifiable goals. 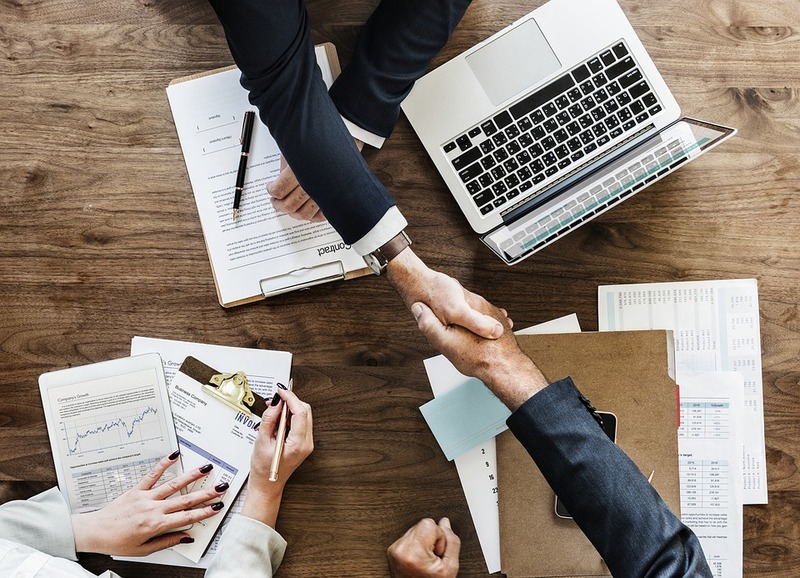 In the marketing plan we provide, we will outline the tactics we recommend in order of priority and provide detailed descriptions of the purpose and scope of each recommendation. This will help anyone assisting with your marketing, outside of Bloom, to remain focused on the goal and suggested tactics. Sample of a client’s Marketing Plan. Get My Assessment and Estimate Today!